If you like cocktails, cosiness and live music, read on. 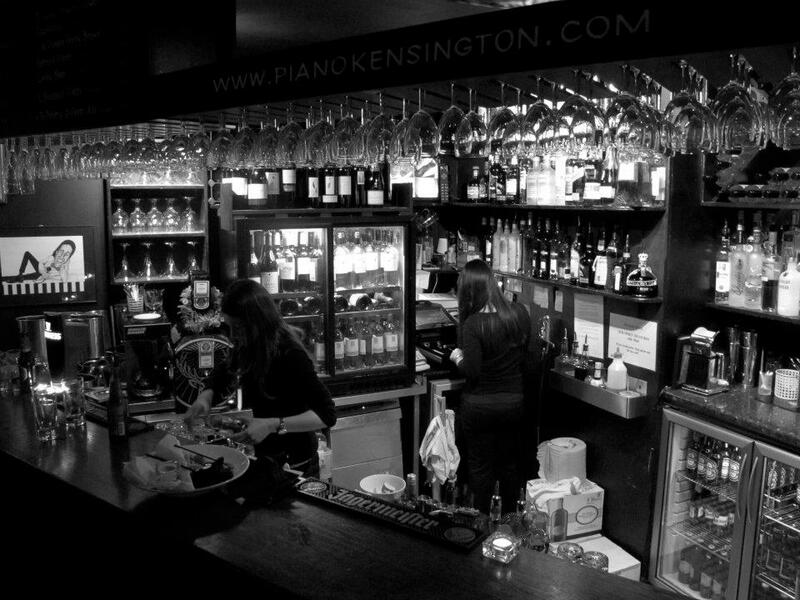 Quoted as being ‘one of the best nights out in London‘ by Edward Sullivan from the Evening Standard, The Piano Bar is nestled behind a single black door opposite Kensington High Street tube station. With live piano playing six days a week until the clock strikes midnight, this wee place is a hidden gem. If you favour flamboyance over minimalism, this may not be your bag. Characterised by its cosy bistro interior, The Piano Bar is understated, continental chic with the real treasure lying in the gastronomy, cocktails and musical magic. Like me, you may find yourself staying far later than planned, mesmerised by classics like ‘Wonderwall’ and ‘I Guess That’s Why They Call It The Blues’ as you make your way through Vodka Martinis and Risotto Balls. The menu includes a range of treats from the Charcuterie Board to the mouth-watering Roast Pork Belly & Apple Slider on a Homemade Brioche Bun, with prices ranging from £5-10 for the Weekly Menu and £12 for the Buffet Menu (which must be ordered in advance). The only red flag is to book a table to avoid disappointment. With no cover charge and a pretty special ambience, it’s no surprise The Piano Bar is popular. And if you get to hear Nick Reeve (aka the Pianoman) play, you’re in for a treat. This entry was posted in bars, Countries, england, england, london, london, Restaurants, Reviews, Travel and tagged bestbarslondon, thepianobarlondon, travellondon on September 20, 2014 by Melanie Pritchard.